Warranties apply a lot of the time when one breaks a rod. But sometimes they don't, or one may have other reasons for considering a self repair. The conventional wisdom says it isn't possible--quite true if the rod is extensively crushed. However I have found that simple snap-offs, which are reasonably clean, are not at all hard to fix. The method proceeds from the observation that spigot ferrules joining rod sections work quite well. In the manufacture, a rod blank is made in one piece and then cut into sections and the spigot joints set up. The Steffen Brothers Rodmakers have a discussion of this on their web site. Such rods of that design that I have examined have no noticeable change in thickness or taper at the joints. Neither does a rod with a clean break. So why not use similar approach to make a permanently glued and wrapped repair. In summary, the method is to use a splint "spigot" of a short length of sufficiently strong tubular material carefully sized to the inside diameters of the rod on both sides of the break, glued in place, and overwrapped with rodmaking thread and coated with rod finish. A US Patent, 3,519,294 describes the construction of spigot ferrules. It appears that the main difference from this repair method is that one side is not permanently glued. For most repairs I use high pressure stainless steel tubing. I get it from McMaster-Carr, usually ordering the thickest wall available for a given tubing outside diameter. See their online catalog page 129. Type 304 stainless is quite adequate for the job. Twelve inch lengths of it run five to seven dollars. Tubing is to be preferred over solid material to minimize the weight added. 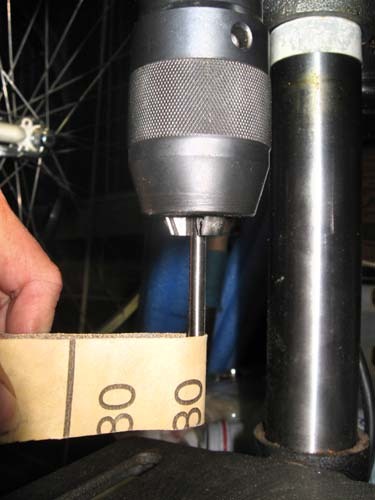 I measure the inside diamter of the rod at the break using a drill index. I find the adjacent pair of drills, the smaller of which will slide into the rod while the larger will not. I then start with a size tubing whose outside diameter is slightly larger than this. I use lengths of tubing 1.5 to 3 inches long, the nearer the tip, the shorter. Stainless steel is fairly gnarly stuff to cut. I use a Dremel tool with a cutoff wheel. Safety glasses are a must when using it. I then use a small drill press running at its highest speed to turn the tubing while I sand it with emery paper to cut its diameter to fit the rod. I take it out of the chuck and check for a slide fit often. I carefully round off the ends so there are no sharp edges there to cut into the rod. For this reason I generally get the thickest wall tubing available to get the greatest radius where I round it off. Obviously this could be done in a lathe, but I don't have one or access to one. I use a good grade of slow setting epoxy to glue the tubing in place. A repair failure using this method led me to the startlingly obvious conclusion that the only useful place for the glue is between the tubing and the blank. The failure happened when I smeared a large quantity of glue up in to the rod before pushing in the tubing. The tubing then moved a lot of glue further up the rod. The glue set and formed a sharp edged meniscus beyond the tubing and beyond the end of the wrapping. The rod, after a considerable amount of use, broke at the edge. This demonstrated that restraint in the amount of glue used is important, as is the rounding the edges of the tubing mentioned above. My current method is to smear the outside of the tubing with glue before inserting it. Most of the glue is scraped off and wiped away but enough is carried in to do the job. I wrap the outside of the rod the whole length of tubing inside plus a bit of overlap on the ends with size A rodmaking thread.. I use a color which is a reasonable match in hue to the color of the blank. It may be lighter in value than the rod, but after is is coated with finish, it will darken to a close match so the repair won't be conspicuous. The finish I prefer for this job is Perma Gloss which is a sort of varnish that does not build up to a thick layer like epoxies do. It's also not necessary to rotate the rod while it sets as it is with epoxy finishes. Four or five coats are sufficient to hide the texture of the thread wrap but not make much bulk. I first started doing this when my wife broke the tip section of an L.L.Bean four piece spin-fly rod. It had been a gift from her father and there was no warranty card. Since the break was near the tip I used a piece of music wire sanded to size as described above rather than tubing. The next year, she broke the tip section again--but not at the repair indicating that it was not a weak point in the rod. I fixed it again using the same method. It's still in use. Another case was a vintage Sage two piece 5 weight. The fact that it had been built by a custom rod maker complicated the warranty situation. It was broken a few inches above the ferrule. It's the rod in the pictures above. It's also the rod which the glue meniscus described above caused to fail. A fair number of good fish were fought and landed with it before it finally did break. It may yet fish again. One might worry that the tubing adds too much weight or has a deleterious effect on rod action. The short answer is, not so I can notice. I have had some sophisticated casters try these rods and they haven't found any significant fault. You mileage may vary. The closer to the tip it's added the more effect weight has. However the closer to the tip the splint has to go, the smaller and shorter it will be, and the less weight it will add. For example, the first break of the L.L.Bean rod was about 5 inches from the tip. The solid steel splint weighed 0.36 grams. The second break was about 9.5 inches from the top and the solid steel splint weighed 0.89 grams. For comparison, tip-tops weigh in the range of 0.6 to 0.9 grams and snake guides weigh in the range of 0.2 to 0.5 grams. So we are talking about weight additions of the same order of magnitude as an extra guide. In the end whatever compromise this represents, it would seem to beat having no usable rod at all. I consider the method experimental at this point, but it does seem promising. To download a PDF version of this article click here.